Deciding how to cook a turkey can be difficult, especially with all the options that are available. Here you will find a listing of different ways to enjoy cooking a turkey. The optimum cooking temperature for deep-frying the turkey is 350ºF. 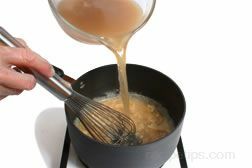 When the turkey is placed into the hot oil, the temperature will drop rapidly; therefore, it is important to preheat the oil to 375°F so that less time is required to restore the oil to the proper cooking temperature. When the temperature of the oil has returned to a range of 325° to 350°F, the cooking process should be timed. 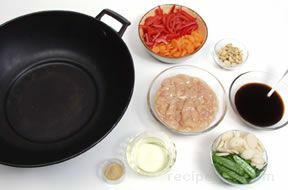 The cooking time is figured as 3 minutes per pound plus 5 minutes. Be sure to monitor the temperature of the oil throughout the cooking process, increasing or decreasing the heat when necessary. 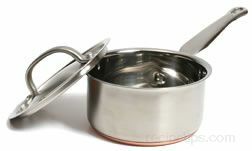 It is important that the temperature of the oil remains near 350ºF for proper cooking. Do not allow the temperature to drop below 325ºF because if the oil is cooler than this, the turkey will not cook properly and it may soak up too much oil. If the temperature of the oil is excessively high, the exterior of the turkey will burn before the interior is cooked thoroughly. Keep in mind that many oils have a flash point of 425°F, which if reached, increases the risk of fire. When the turkey is fully cooked, it will float and the exterior will be nicely browned. 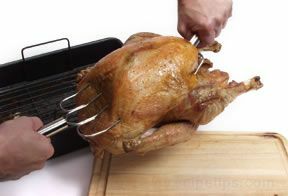 While wearing long oven mitts, attach the lifting hook to the basket handle or the loop on the turkey stand, and slowly lift the turkey from the hot oil. 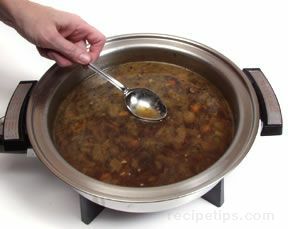 Allow the basket to hover over the top of the cooker so that some of the oil will drain from the turkey into the pot. It may be necessary for two people to lift the turkey and hold it over the top of the cooker while the oil drains from the turkey. 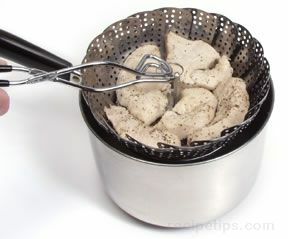 Some turkey deep-fryer models include a clip attachment on the rim of the pot that allows the basket to be attached to the rim, eliminating the need for the basket to be manually held over the surface of the cooker for drainage. When using a propane gas cooker, the burner must be switched off before removing the turkey. 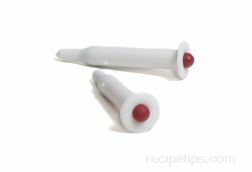 The turkey must be checked for proper doneness using a meat thermometer. 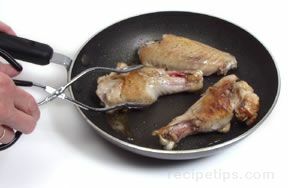 The breast should reach 170°F and the thigh should reach 180°F. If the turkey is not done, return it to the hot oil and cook it for an additional 5 minutes. After the turkey is removed from the cooker and the oil has been drained from the bird, place the basket or turkey stand on the baking sheet or pan that was previously lined with newspaper or paper towels so that additional oil may be drained. Leave the turkey in the basket and wrap it loosely with foil. Allow it to rest for at least 15 minutes before carving. 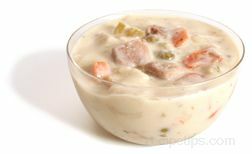 The resting period allows the juices to be reabsorbed back into the meat. After the resting period, remove the turkey from the basket or turkey stand, then carve it and serve. 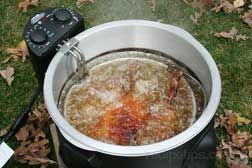 Click here for detailed information on Deep Frying Turkey. 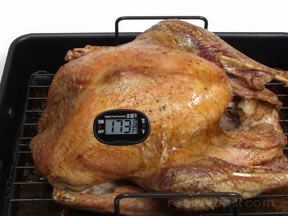 Roast the turkey uncovered at a temperature ranging from 325°F to 350°F. 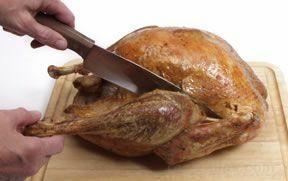 Higher temperatures may cause the meat to dry out, but this is preferable to temperatures that are too low which may not allow the interior of the turkey to cook to a safe temperature. Some cooks prefer to roast the turkey at temperatures as high as 450°F to 500°F for the first 30 minutes in order to brown the surface. The heat is then reduce to 325°F for the remainder of the cooking time. It is important to keep the oven door closed as much as possible while the turkey is roasting to maintain a constant temperature within the oven. 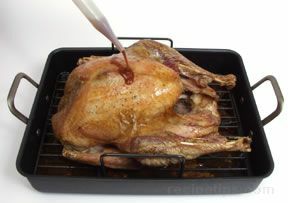 Basting a turkey provides a crispy, golden skin, but it does not add moisture or flavor to the interior of the turkey. Basting should be kept to a minimum so that the oven door is not opened too often. The more times the oven door is opened, the longer the cooking time will be because of heat loss within the oven. 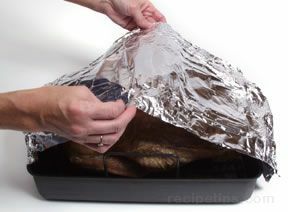 Aluminum foil can be tented over the turkey near the end of the cooking time to keep the skin from becoming too brown. 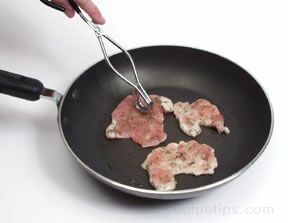 Use a meat thermometer to determine the proper doneness, which is at least 170°F for the breast and 180°F for the thigh. After removing the turkey from the oven, the temperature of the meat will increase by about 5° as the turkey rests. 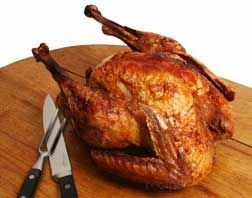 It is important that the turkey is not overcooked, because the breast meat may dry out quickly. After the turkey is removed from the oven and before the turkey is carved, allow it to rest at least 20 minutes so that the juices settle within the meat, which provides the meat with more flavor and tenderness and will also make carving much easier. More or less time may be allotted depending on the size of the turkey. Large lifting forks, such as those shown in the picture at the right, should be used to remove the turkey from the roasting pan. 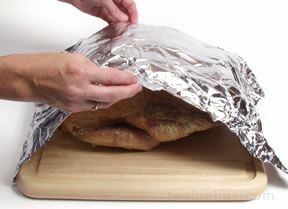 After the turkey is placed on a large, clean cutting board, it should be tented with aluminum foil to retain heat while it is resting. Click here for complete instructions on How to Roast a Turkey. 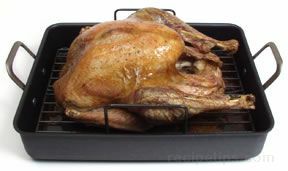 The purpose of indirect heat cooking on a grill is to allow whole turkeys or thick pieces of turkey to cook thoroughly while preventing the surface of the meat from burning. 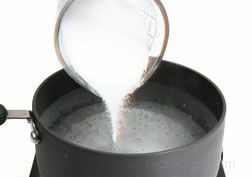 Indirect heat cooking is often done in conjunction with direct heat cooking. Large turkey pieces can be seared over direct heat and then the cooking process is finished using indirect heat to slowly cook the meat to the correct doneness. Removing the skin from the whole turkey or individual pieces before grilling increases the risk of the meat becoming too dry. The skin provides protection against excess moisture loss so it is best to leave the skin on during grilling and it can then be removed before serving. If the skin must be removed before grilling, the surface of the meat can be brushed with some olive oil to help keep it moist. 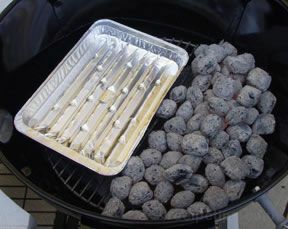 Alternate methods for arranging the coals include pushing half the coals to one side of the grill and the other half to the opposite side with the drip pan placed in between or the coals can be placed in a ring, surrounding the drip pan. The grill is covered and the turkey is cooked to the appropriate doneness. 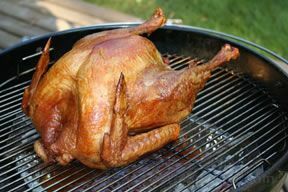 Click here for complete instructions on Grilling Turkey or here for How to Rotisserie Grill a Turkey.